Anyone in sales knows the importance of a good CRM. If we don’t log all of our interactions with a lead, we’ll have absolutely no recollection of where we left off in the conversation. At Attendware, we use Pipedrive and meticulously track everything that we do. Recently, I realized that I have many other conversations, meetings and interactions with people outside of sales, and sometimes struggle with the same challenge of remembering key points and keeping action items organized. I decided that I wanted a version of Pipedrive for non-sales interactions. Whenever I meet with a mentor, have a call with a potential teammate, etc, I wanted to be able to log it. Basically, I wanted a personal CRM. So I took to Google and began scouring the web for an existing product. It seemed like the best solution out there is Highrise by 37 Signals, which may be a good tool, but is also far more cumbersome than what I needed. After feeling a bit discouraged from my failed search, I suddenly realized – “This would be a pretty simple app… I could just build it myself. I bet I could finish the whole thing in a day.” I started outlining the app and discovered it would indeed be quite simple: just a database table of contacts and a table of interactions. I’d need to be able to add new contacts, log meetings or phone calls, add notes and a date… nothing that a little PHP and MySQL can’t handle. I used the cliché Twitter Bootstrap front end framework and cranked through the code Saturday night and Sunday morning. 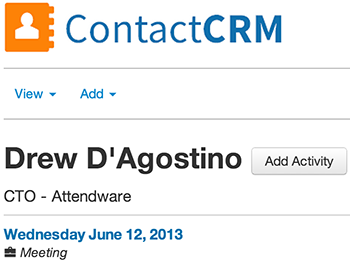 By lunch on Sunday – ContactCRM existed! 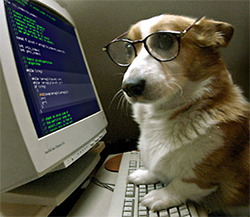 I am by no means a professional back-end developer. I have no formal training and learn as I go by reading tutorials and searching for examples on Google. However, in just a day, I was able to create this tool that solves a legitimate problem and provides real value for myself. Just like being able to fix your own sink or build your own patio, knowing how to code can become a household skill that is no longer reserved for career programmers. Imagine the possibilities as many people pick up the skills to build their own software for personal use. It might even be how some of the future’s great companies get started.